Dracula – Mark Loves History! 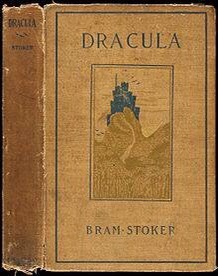 Today in History, May 26: 1897 – Bram Stoker’s Dracula is first published in London. It was not the first vampire novel, but it is recognized as popularizing the genre which has become almost a cult today. Although his novel won him high praise from his contemporaries, including book reviewers and the likes of Sir Arthur Conan Doyle, it did not initially experience commercial success. Stoker died broke and his widow had to sell off his notes for the book at auction…for two pounds. It wasn’t until movie makers in the 1920’s and 30’s began making movies based on the novel that the novel reached it’s due popularity, and it hasn’t been out of print since. Stoker’s widow had to sue in order to get her family’s part of the profits, but she did succeed.